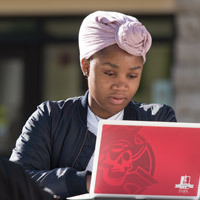 Explore computer discounts for students. Flexibility, meet credibility. Our online programs allow you to study anytime, from anywhere in the world. As an enrolled Park University student, you’ll tap the resources of a fully accredited, nonprofit, four-year liberal arts university. Invest in your education with confidence. We are ranked among the top schools in the midwest and the U.S. for veterans and adult learners. We are accredited by the Higher Learning Commission. We offer courses certified by Quality Matters, a leading online-learning assessment organization. Our classes are scheduled in accelerated, eight-week terms. You have the opportunity to start five times each year: January, March, June, August and October. As a leader in higher education since 1875, we have a long history of academic excellence. We apply the same standards to our online programs as we do on any Park campus. You’ll engage with a strong, supportive, and diverse community of students from all over the U.S. and the world. Small classes, taught by experienced professors, offer a broad perspective and market-ready skills for a competitive global market.